Nelios.com is the first company in Greece to apply “dynamic package” solutions for travel agencies, a new technology offering collaborative benefits to all parties involved. Dynamic package is about the dynamic administration of a travel booking website. Reservations are made in real time, without intervening middlemen. This results in affordable prices, while increasing bookings, which leads to higher profits. This is an easy to use dynamic package to suit the needs of every company, which fully meets customer requirements, allowing the site's visitors to complete the process of finding a flight-hotel package in two consecutive steps. Firstly, visitors should complete a short form with basic information about departure and return, if any. After displaying the results relating to flight schedule, the visitor would be able to select the preferred one. The results, then, are being re-filtered in order to display the best possible proposal, based on the new information input about hotel preferences combined with the flight preferences. 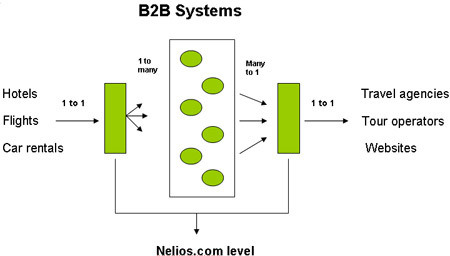 The implementation of dynamic package by Nelios.com optimizes the booking process, incorporating one extra step which verifies the best possible result. The benefits generated by the use of this package, assist in addressing the recent financial crisis - particularly in the Tourism sector.